In The Pack, man’s best friend becomes his worst nightmare when a horde of bloodthirsty wild dogs descends upon a family’s farmhouse. In a remote stretch of the Australian Outback, a sheep rancher (Jack Campbell), his veterinarian wife (Anna Lise Phillips), and their two teenage children live in bucolic isolation--until a horrifying night when a pack of fang-baring, four-legged, rabid beasts besiege their home. With no one around to help them, the family must band together to survive--or else become canine kibble. 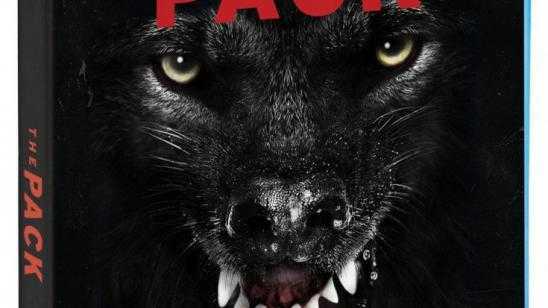 Generating a steadily mounting sense of dread, The Pack cleverly toys with genre conventions before it goes in for the kill. The Pack also includes the featurette "The Making of The Pack" and theatrical trailer as bonus features. Fans can pre-order their copies now by visiting ShoutFactory.com. Official Synopsis: A farmer and his family must fight for survival after a ferocious pack of wild dogs infiltrates their isolated farmhouse. Through a series of frightening and bloody encounters they are forced into survival mode to make it through the night.